Large for-hire carriers and major retailers are reserving their places in line to be among the first to test the all-electric Tesla Semi in their operations. J.B. Hunt Transport Services Inc., NFI Industries and Bison Transport Inc. and retailers Wal-Mart Stores Inc., Meijer and Loblaw Cos. confirmed that they have pre-ordered the truck or plan to do so. The Tesla Semi is scheduled to enter production in 2019. ANALYSIS: Will Musk's success with electric cars translate to trucking? LIVEONWEB: How does electric fit in with the trucks of tomorrow? J.B. Hunt said it has placed a reservation to purchase “multiple” Tesla Semi tractors, which it plans to deploy in its intermodal and dedicated contract services divisions to support operations on the West Coast. J.B. Hunt ranks No. 4 on the Transport Topics Top 100 list of the largest for-hire carriers in North America. 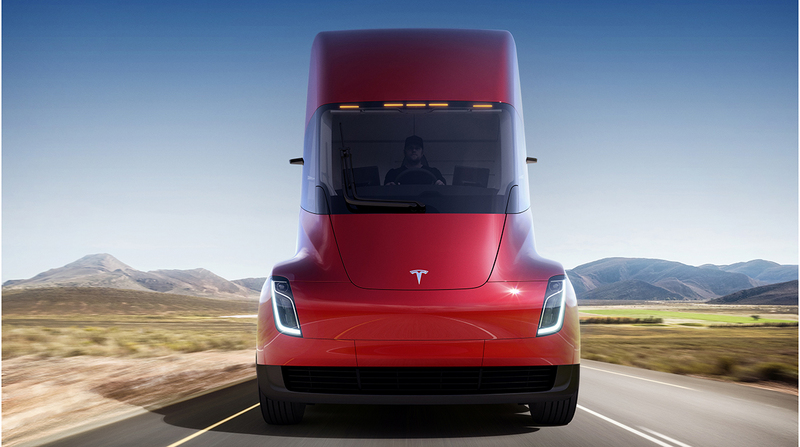 Truckload carrier NFI Industries said it will expand its fleet with Tesla’s all-electric trucks to advance its environmental sustainability initiatives. With its acquisition of California Cartage Co. in October, NFI operates one of the largest drayage fleets in North America. NFI ranks No. 27 on the for-hire TT100. Wal-Mart has pre-ordered five Tesla Semis for its U.S. operations and 10 more for its Canadian business. Another major retailer, Meijer, also plans to test the vehicle in its fleet. Canadian food retailer Loblaw Cos. has placed an order for 25 trucks “and will have them in Canada as soon as they’re available,” the company said in a statement. Bison Transport also will be in line to test the Tesla Semi, said CEO Rob Penner, who attended the truck’s Nov. 16 unveiling in Hawthorne, Calif.
“We do see potential for electric trucks in our regional and medium-range operations, so this is definitely something that we will fully evaluate,” he said. Bison Transport ranks No. 74 on the for-hire TT100. Penner said the electric truck has far fewer parts and appears much less complicated than today’s diesel trucks. He also cited Tesla’s design features aimed at improving driver comfort and safety. However, key questions about Tesla’s truck remain. In a note to investors, Stifel analyst Michael Baudendistel wrote that Tesla’s presentation raised more questions than it answered. “While the truck was impressive in many ways, we’re not yet sure of the economic case for truckers,” he said. Baudendistel said that assessing the potential return on investment starts with the vehicle’s price, which wasn’t disclosed. Tesla also did not reveal the weight of the truck’s battery pack, which could cut into its payload capacity, he said.